I can think of three different meanings to “it is finished.” In one sense it communicates a sense of resignation and negativity. Your career is finished, your money is finished, your family is finished and you might think you are finished. The world we live encourages negativity and self-pity. ‘It is finished’ is the acceptance of defeat. Then there is the perspective of Jesus’ enemies. They were happy that Jesus was finished. They put him on a cross and expected to put an end to his life, his teachings and his movement. But they were wrong. In history on several occasions there have been attempts to finish Christians and Christianity. But Christians have survived. I am still here and you are there reading this devotion. Then there is a positive “It is finished.” Ah, what relief those three words bring to us especially at the end of any project, a sickness, a court case or a Ph.D., dissertation. When Jesus says, “It is finished,” he means he has fulfilled his mission. It is a proclamation of completion. Jesus’ ministry began with the words, “This is my beloved Son, in whom I am well pleased.” It ends with Jesus’ confident proclamation, that the work that he had come to do is finished. He had submitted his will to the father from the beginning to the end. In his high priestly prayer Jesus prays, “I glorified you on earth, having accomplished the work which you gave me to do; and now, Father, glorify me in your own presence with the glory which I had with you before the world was made (John 17:4-5). The cross was Christs act of obedience. The cross is not the demand of a blood thirsty God rather it is an act of a merciful God. Imagine us humans in a pit unable to get out. Then imagine God as a loving parent entering that pit, clearing all the filth and dragging us out. Jesus enters the system, purifies it from within and redeems us. Dear Lord, we pray that You would take our negativity and change it to positivity. In the Name of Jesus, Amen. He was thirsty on the cross and he accepted the drink offered to him. Two drinks were offered to Jesus. One, in Mark 15:23, sour wine mixed with myrrh to dull the pain which he did not accept. Two, In John 19:28-29 he accepts the other drink which was meant purely to satisfy his parched throat. Jesus has been thirsty before. He asked the Samaritan woman for water. However, he turned his thirst into a conversation about quenching her spiritual thirst with living waters. When you walk up the stairs of the Mother Teresa ashram in Kolkata you cannot but notice Jesus hanging on the cross and painted on the wall beside the crucifix are the words – I Thirst – in bold. It is interesting to hear Mother Teresa’s explanation, “They serve as a constant reminder of the purpose of the Missionaries of Charity. They remind us what a Missionary of Charity is here for: to quench the thirst of Jesus for souls, for love, for kindness, for compassion, for delicate love.” There are many people out there to whom Jesus would make a world of a difference. Two, we would have run to Jesus with something to quench his thirst on the cross. Today we have the opportunity to go out and meet the physical needs of people around us. This is not something strange, Jesus talks about this in Matthew 25:35. He wants us to see him in the sufferings of others and lend them a helping hand. 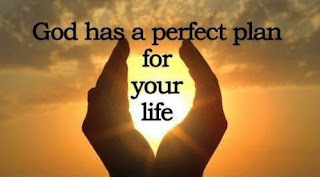 Dear Lord, help us to take the rest we have found in You to restless hearts all around us. In the Name of Jesus, Amen. 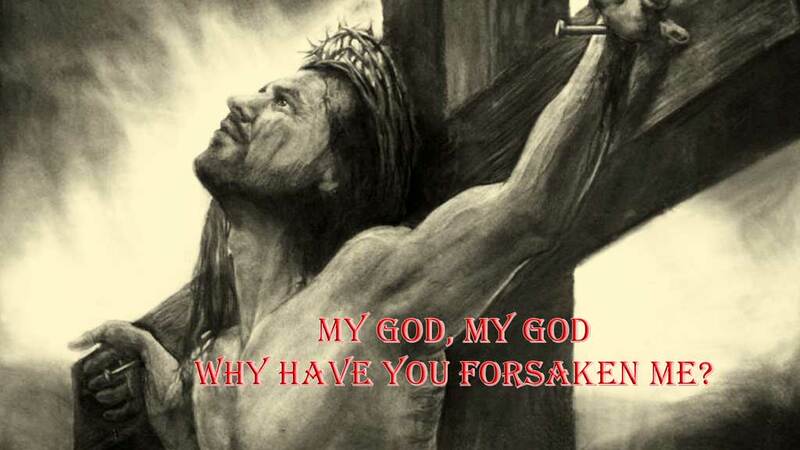 What a heart wrenching question from the mouth of Jesus. The son who has been sharing an unhindered relationship with his father since eternity, is now driven to say these words. While we might think he is tempted to doubt his father’s love, he positions his circumstance against the backdrop of scripture and quotes from Psalm 22:1. From the depths of his pain he quotes scripture. Jesus’ life is so steeped in scripture. Just as Psalm 22 is the cry of a community, Jesus here is identifying with the sufferings of this world and experiences what it means to be concealed from God’s love. He enters our struggle and abandonment and experiences what each one of us has to go through when we abandon the love of God for other lesser loves. The writer Augustine expresses this beautifully, Jesus is praying as the head and as the body. This cry is a reminder that Jesus unites all our suffering. As Christians, we are reminded here that our suffering is not private. Jesus associates with us. Our suffering is also not private because we are a community of believers. Ideally, we ought to suffer with those who are suffering. Today, let us remember that our suffering is not an isolated experience but we have Jesus who suffers with us. Let us also remember those who are suffering so that we may enter into their circumstances and offer our help and assistance. We might feel Jesus isn’t doing enough to alleviate our suffering. Instead, he seems to plunge us deeper. That is right, he plunges us deeper by helping us realize that our suffering is not in vain. It is not meant to be an individual experience but a cooperative experience of redemption. Jesus’ involvement in human suffering and his cry of abandonment must serve as a model for us to stand in the gap and help. Dear Lord, help us to step into, walk with and alleviate the pain of those who are suffering. In the Name of Jesus, Amen. 25 but standing by the cross of Jesus were his mother and his mother's sister, Mary the wife of Clopas, and Mary Magdalene. 26 When Jesus saw his mother and the disciple whom he loved standing nearby, he said to his mother, “Woman, behold, your son!” 27 Then he said to the disciple, “Behold, your mother!” And from that hour the disciple took her to his own home. This is the second time Jesus is referring to his mother as “Woman.” The first time was at the beginning of his ministry at the wedding of Cana. And now at the end of his earthly life he refers to her as “Woman.” At the start of his ministry she spoke and expected him to obey. Now at the end of his earthly life she sits quietly by his cross. Mary is a model mother, who steers her children to go out and do something but continues to stand by her children when the going gets tough. Parents have the privilege of steering their children to accomplish something beautiful. However, there are also times when parents are brought to their knees to silently cry for their children. While Mary was crying, Jesus was making all things new. This offers hope to parents that Jesus is going to make all things new. The tears for our children will not be in vain. He will, indeed, make all things new. The relationship children share with their mothers is most special. Mothers usually care for their children in ways most fathers struggle to. Here, we find at the foot of the cross when most people have abandoned Jesus, his mother, his aunty, 2 Marys and John. It is difficult to be the mother of a misunderstood child. I have seen mothers argue on behalf of their children who they think deserve more. Mary here, is portrayed quiet at the foot of the cross where her bleeding son hangs. What the silence implied is difficult for us to comprehend. Maybe, Jesus heard her heart's cry and the loneliness she might be feeling and said, “Woman, here is your son,” and then looking at John he said, “This is your mother.” We have an opportunity this season to reach out to our parents and offer them our company as they wade through the struggles of old age. Like John, we can also reach out to the elderly in our community; welcome them into our homes. Or visit them, listen to them, or simply just give them company. Dear Lord, hear our heart's cry and help us to hear the silent cries of the elderly wherever they might be. In the Name of Jesus, Amen. To Satan he responded with scripture. To the first prisoner he chose to stay silent. He didn’t see the need to defend his identity. Conversely, the second criminal on the cross does not want Jesus to ‘perform’. Rather, he wants Jesus to ‘remember’ him. So to the second prisoner Jesus says, “Today you will be with me in paradise.” Jesus’ ultimate answer to every one of our requests is – heaven. Yet, he reminds us that heaven is not merely a place. It is a person. “You will be with me.” Heaven is where Jesus is. The offer of heaven is himself. He can make heaven enter into our lives if we are willing to allow him to make his home in our hearts. Jesus can help us change the perspective of our experiences. The second criminal surprisingly viewed Jesus as ‘The King’ despite Jesus’ powerlessness. 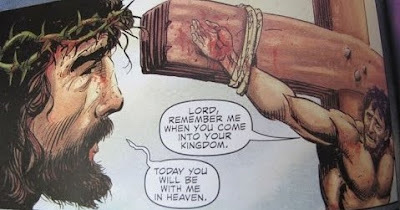 He asked Jesus for the most important thing – to remember him. Don’t we all get a boost when someone great remembers us? What a privilege for us to see Jesus now in all his power and know that he remembers us! Today let us remember two things. One, heaven is not only a place to arrive at but we can have a foretaste of it, here on earth, with Jesus in our hearts. Two, Jesus has regained his splendor and majesty and he remembers us by name. Dear Lord, help us to live everyday with the knowledge that You remember each of us. Help us to share that great gift with those around us today. In the Name of Jesus, Amen. 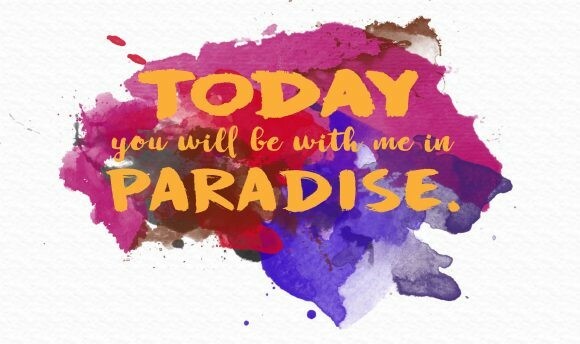 Labels: Easter 2019, Today you will be with me in paradise. 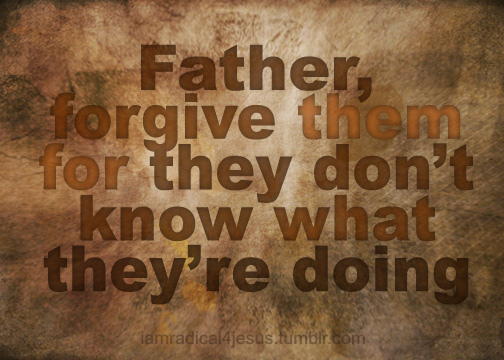 Even from the cross Jesus along with the father forgives his perpetrators. The union that he shares with his father is evident even in his forgiveness. Jesus teaches us that when injustice is being done to us the father takes it personally. Likewise, when we forgive we are forgiving on behalf of the father. Jesus then reminds us that sin is ignorance. When we sin we become ignorant. We become so ignorant that despite being aware of the consequences of our behavior we still choose to go ahead with our action. Jesus reminds us from the cross that we can accept his forgiveness and change our ways. Forgiveness is a very difficult decision. But it is a very important decision. More than anything, it offers us, the victim, freedom. We must strive to forgive, because the father has forgiven us. With God all things are possible. So with God’s help let us try to forgive. Additionally, with the power of the Holy Spirit let us hope for our pain to be transformed into compassion and our memory into prayer and intercession. The cross is at the center of our journey as Christians. Jesus reminds us from the cross that forgiveness comes from the father's loving heart and we must extend this forgiveness to others. Dear Lord, thank you for the relief that Your forgiveness brings to our life. Help us find others to offer it today. In the Name of Jesus, Amen. 3 For I delivered to you as of first importance what I also received: that Christ died for our sins in accordance with the Scriptures, 4 that he was buried, that he was raised on the third day in accordance with the Scriptures. Life without the empty tomb would be hopeless. 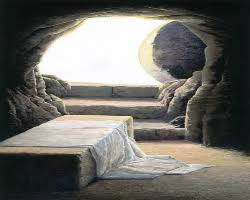 The very existence of Christianity depends on the truth of the empty tomb. Without Jesus fulfilling the promise to rise from the dead, where would we be? Mary Magdalene saw it with her own eyes though. Mary Magdalene, the woman who was once possessed and didn’t know hope until Jesus found her, was the one to first see it with her own eyes. And not only did she see the empty tomb, she saw Jesus. Jesus came to her and spoke her name. He simply spoke her name and things changed for Mary Magdalene. Hope had come back into her life. When he walked out of that tomb, Jesus brought hope to the hopeless. He conquered death. He conquered death. Our victory is in Jesus. Our victory is in his life, his death, and, praise God, his resurrection. The resurrection means everything. The resurrection validates that Jesus was who he said he was. It validates every word Jesus ever said. It shows us that Jesus can be trusted. He does what he says he will do. The resurrection gives us unbreakable hope. Will you say yes to that hope today? Will you live fully today because of the victory we have in Jesus? Today’s Challenge: Be joyful today. We have the ultimate hope. And if someone asks why you have so much joy today, tell them why. Dear Lord we thank You for the hope that we have through what You did for each of us. In the Name of Jesus, Amen.